Polish Ex-Servicemen's Association Branch No 8 - opening of a new building & picnic. When: Saturday, 20 April 2019, 12.00. "Picnic in Capalaba" - Soccer volleyball tournament. When: Sunday, 19 May 2019, 11.00. "Biesiada pod sosnami" - Revelry under pines. When: Saturday, 20 July, 18.00. "Dzien Zolnierza" - Soldiers Day. When: Sunday, 18 August 2019. Polish Multicultural Spring Festival 2018 - "Polska Wiosna 2018". When: Sunday, 8 September 2019, 11.00 - 16.00. Annual SPK Soldier's Dinner - Lunch. When: Saturday, 26 October 2019, 18.00. Polish National Independence Day - Academy in Brisbane. When: Sunday, 10 November 2019. 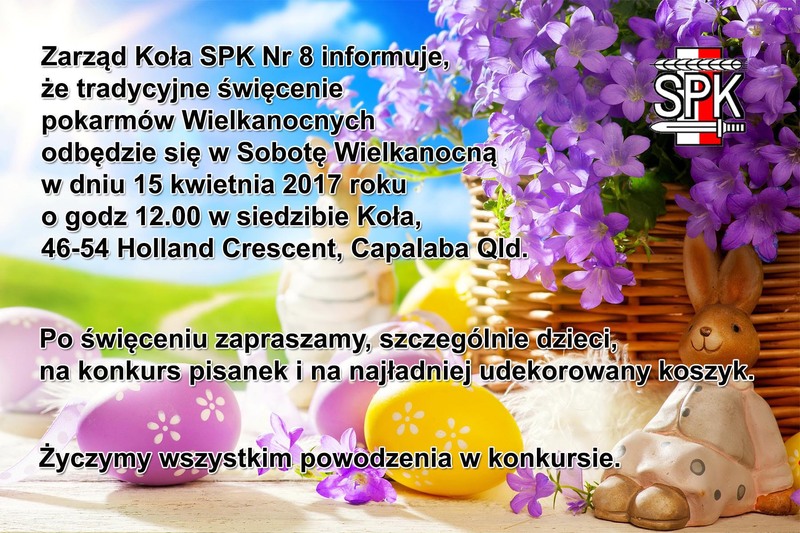 Annual "Opłatek Żołnierski" - SPK Capalaba. When: Sunday, 8 December 2019, 13.00.